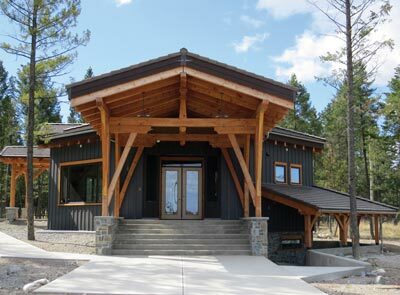 College of the Rockies' celebrates the grand opening of the Aboriginal Gathering Place. College of the Rockies, along with the Ktunaxa Nation and MLA for Kootenay East, Bill Bennett, celebrated the grand opening of the College’s Aboriginal Gathering Place on Friday, October 31, 2014. Representatives from the Ktunaxa Nation, the Shuswap Band, the Metis Nation and students who worked to build the Gathering Place were among the invited guests for the event which commenced with the raising of a Ktunaxa flag outside of the College. Located at the College’s main campus in Cranbrook and on the traditional territory of the Ktunaxa Nation, the Gathering Place will serve to build bridges of understanding between different voices and cultures. In particular it will help create a welcoming, safe and supportive learning environment for Aboriginal students attending College of the Rockies. In a sunrise ceremony prior to the official grand opening, Ktunaxa Elder Herman Alpine provided a blessing for the building. The Aboriginal Gathering Place holds a particularly special significance for Alpine as he and his family once lived where the Gathering Place now sits. Speakers at the event included College of the Rockies Board of Governors’ Chair Dave Handy, Minister Bill Bennett, Kathryn Teneese and Gwen Phillips from the Ktunaxa Nation as well as Marilyn Taylor from the Metis Nation. "This new building reaffirms the Ktunaxa Nation's and College of the Rockies' commitment to supporting and enhancing Aboriginal education in Ktunaxa territory. This close collaboration has resulted in this beautiful new space where students from all over the world can learn and share in a supportive and inclusive environment," explains Kathryn Teneese, Ktunaxa Nation Chair. Students from College of the Rockies’ construction trades programs participated in the building of the Gathering Place, which received funding from the Ministry of Advanced Education and Columbia Basin Trust. Additional funds were provided by Teck Resources and the Ktunaxa Nation. The Aboriginal Gathering Place will be open for public viewing on November 5th from 1:00 – 4:00pm.